David Beckham will decide to join Paris Saint-Germain or stay with Los Angeles Galaxy when he returns from the latter club's post-season tour in December. Beckham has also had interest from a club in Italy and one in Brazil, but will consider only France and the US. Reports that the 36-year-old midfielder has already agreed to sign for PSG are understood to be premature. The former England captain has also been linked with Tottenham and QPR but is not considering a return to the UK. He will continue to discuss the next step in his career with his family and business partner Simon Fuller. If he moves to Paris, it is understood his wife Victoria and four children will go with him. But, as things stand, no decision has been made and he will not break off from his Major League Soccer club's Asia Pacific tour. The squad flew to Indonesia on Saturday and will play the national team in Jakarta on Wednesday before facing the Philippines national side in Manila on 3 December. They conclude the trip in Australia with a match against Melbourne Victory on 6 December. Beckham's five-year Galaxy contract expires on 31 December and he has not ruled out accepting the offer of a new one-year deal to remain in California, where his family are settled. However, the former England captain - who has also played for Manchester United, Real Madrid and AC Milan - wants one final big challenge and negotiations with PSG are at an advanced stage. The Daily Mail claimed on Friday he has been offered an 18-month contract worth £11.6m, with money not an object for the French club's Qatari owners. It is said Beckham was hand-picked by PSG president Nasser al-Khelaifi as part of his strategy to turn the Ligue 1 side into a football superpower. What is certain is that any deal will at least match the £4.2m a year he earned with Galaxy. In PSG's favour is their European location, with Beckham desperate to be a part of the Great Britain football team at the 2012 Olympics in his native London. 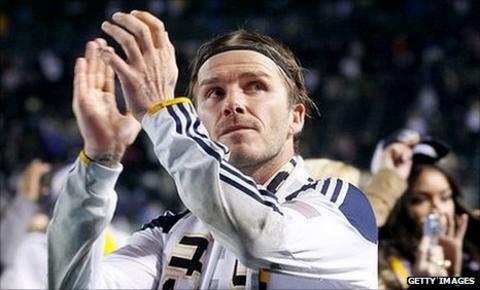 Beckham joined LA Galaxy from Real Madrid in 2007 and, after two loan spells with AC Milan, recently helped the Californian side to the MLS Cup with a 1-0 win over Houston Dynamo.